Summer is on its way fast, and that means family barbecues, picnics, and enjoying the great outdoors is approaching. As you know, mosquitoes are worst during the summer and we all need to be protected. The pose serious health risks nowadays, fortunately the folks at Orkin have you covered. At Orkin, we use the latest technology and unparalleled training to develop an effective treatment that's right for your needs. To learn more about our pest control based in science or to schedule an inspection, visit orkin.com or call 1-800-800-ORKIN. To help prepare you and your family for mosquito season, Orkin has developed a "Buzzer Beater" app. It includes deep scientific knowledge about mosquitoes. Try your knowledge and be sure to enter below for this amazing prize pack! Do you think mosquitoes prefer children over adults? Find out by watching the video below. **No compensation was received for posting. Freda's Voice is not responsible for the prize shipment, lost, damaged or stolen prizes. 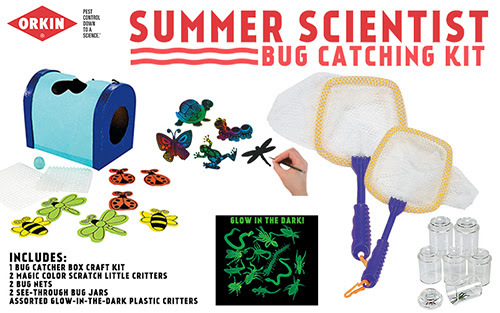 Each household is only eligible to win Summer Scientist Bug Catching Kit via blog reviews and giveaways. Only one entrant per mailing address per giveaway. If you have won the same prize on another blog, you will not be eligible to win it again. Winner is subject to eligibility verification. There were a lot of interesting facts I learned. I could have done better on the quiz but I at least know more now. Whats to say about mosquitoes except I hate those blood suckers.